Willa Cather regarded Sarah Orne Jewett as one of America’s essential writers along with Mark Twain and Nathaniel Hawthorne, yet the later twentieth century saw Jewett’s reputation diminish to the status of local colorist. 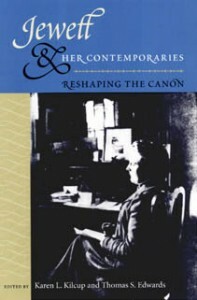 Jewett and Her Contemporaries: Reshaping the Canon reestablishes the writer as indispensible for comprehending fin-de-siècle American literature and culture. Offering innovative perspectives on Jewett’s wide-ranging perspective, the authors demonstrate her importance to writers that include William Dean Howells, Edith Wharton, and Cather herself. They also illuminate her contributions to conversations on such subjects as transcendentalism and ecofeminism, social class disparities, sexual and racial identity, the conceptualization of childhood, local and national identity, and author-reader relations at the end of the nineteenth century. Jewett and Her Contemporaries reveals a writer fully engaged with her time and place whose work merits renewed attention, appreciation and admiration for its continuing resonance.